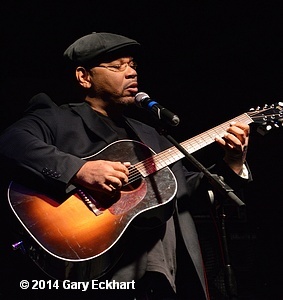 Norman Taylor knew full well what he was getting into when he made the decision to play the blues for a living. 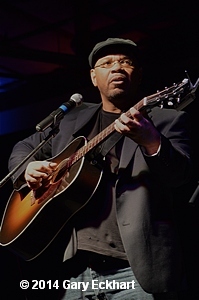 Well aware of the early careers of those that inspired him – cats such as Guy Davis, Eric Bibb and Keb Mo – Taylor relegated himself to the fact that there would be plenty of solitary hours spent on a seemingly-endless highway, driving from one gig to the next, and the next and the next. 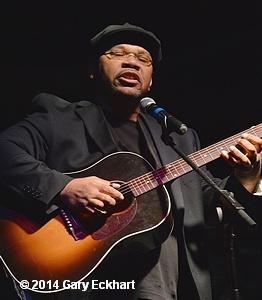 Where some might look at such grueling excursions as pure misery, the acoustic bluesman from the Philadelphia area looks at road trips like that as an opportunity; an opportunity to further spread the gospel of his debut CD, Blue Soul (Soul Stew Records). Blue Soul was feted with a nomination for Best Acoustic Blues Album at this year’s Blues Blast Awards and its 11 tracks (10 of which are Taylor-penned originals) seem to be in perfect lock-step with the space that its creator is in these days. That New Thought philosophy comes through loud and clear on Blue Soul. Sure, the music on the disc is most definitely the blues, and as such, it deals with much of the same subject matter that the lion’s share of music cranked out in the genre does. But the underlying vibe is of a hopeful, positive nature. Put it this way – you won’t hear a whole lot of downtrodden and depressing woe-is-me kind of tracks on Blue Soul. The casual blues fan might be a bit taken aback to find out that a youngster that called the urban stomping grounds of Philadelphia home could fall under the spell of the deep country blues that are generally associated with the south. Though he’s deeply into playing the blues these days – as he has done for a solid decade now – Taylor still hasn’t turned his back on the sounds of his youth. 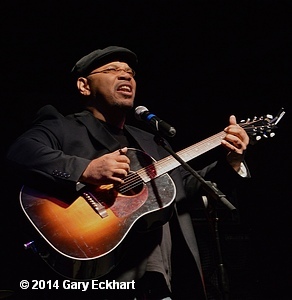 Instead, he meshes those smooth, soulful-type bits with the gritty, roughed-up blues. Dips into R&B, rock-n-roll and even a bit of jazz preceded Taylor’s full emersion into the bluesy side of the music dial. That helped Thomas travel backwards – so to speak – and connect the dots between Bibb, Davis, King and Keb Mo with the elder bluesmen that inspired them to set out down the road playing the blues. The way that Taylor works his magic on the acoustic guitar is immediately satisfying and could easily be as on-target at Carnegie Hall as it could at a backwoods juke joint. Every accolade that Taylor has earned for his guitar skills is certainly well-earned. It’s also worth reinforcing that his vocals are every bit as on-point as his picking skills are. His youthful days of singing along to a tune predate the first time that young Norman Taylor first picked up a guitar and began to strum. Taylor’s family later relocated to New Jersey and his musical education continued to develop in his brand-new environs. What he didn’t know at the time – but sure does today – is that he was also getting a cursory glimpse into the world of the blues at the same time he was getting turned on to the rock sounds of the ‘70s. That intrinsic and deep connection with the blues that Taylor felt before he could even label what it was, has been around since the dawn of time. And as they were back then, the blues can be every bit as liberating and emotionally-healing today as they could back in the 1920s. Taylor has a particular fondness for Gibson guitars (“I have a J-45 and an L-00,” he said), but he also has a couple of Martins, including an Eric Clapton signature model that he had the factory put the same electronics in that Slowhand’s guitar has. All of that should come as no surprise to acoustic aficionados. But what might catch one off-guard is in Taylor’s weapon of choice when it comes to laying down some gutbucket slide. Taylor seems to be right at home – and in the perfect place – on Soul Stew Records, an emerging new label that hails from just outside the D.C. area and has been releasing albums for a couple of years now. If Taylor has his way, he will make sure that the music-loving masses view acoustic blues as something more than just background music. If Blue Soul is any indication, it seems that Taylor’s melding of the more traditional sounds of Philadelphia with the more traditional sounds of the Mississippi Delta has managed to create a space for itself into the crowded field of blues music in the 21st century. And Taylor plans to keep working hard to build on what he’s started. That includes plenty more miles on that never-ending highway.